Please join us as ushers, ticket takers, hospitality greeters, ticket sellers, party hosts, etc. We ask you commit to four hour shifts in areas that interest you most. It’s great fun and you’ll meet lots of wonderful people! As a thank you, you will receive a ticket voucher to any screening for each four hour shift you complete. Click this button to sign up! 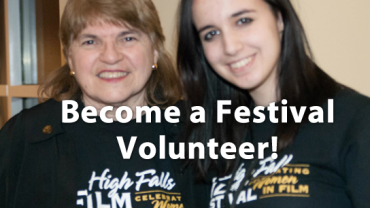 Special Note for those who volunteered in the past, during 2001 – 2011: There’s a new management team in place at the High Falls Film Festival, and we understand that there are many enthusiastic and dedicated volunteers out there who have helped in the past! As in any transition, sometimes records go missing. So, unfortunately, we don’t have your contact information to reach out to you (for those who volunteered in 2011 or before). If you have volunteered in the past, won’t you please sign up again, so we can welcome you back as part of our valued volunteers again this year?! We look forward to meeting and working with you this fall!